Last month was a disappointing month for India's world No 4 P.V. Sindhu after the heartbreaking defeat in the women's singles final in Glasgow, Scotland. But on Sunday the 22-year-old silver medallist was on the top of the world when she won her second Super Series title this year - the Victor Korea Open in Seoul. The Korean Open victory was extra sweet for Sindhu because the opponent in the final was was none other than Japan's Nozomi Okuhara. It was Okuhara who beat the lanky Sindhu for the world title with a 21-19, 20-22, 22-20 win in a gruelling match that lasted 110 minutes - the second longest women's singles match in the history of the game. Sindhu did not have it easy in the Korean Open either as it was another three-game battle but this time the Indian nailed it with a 22-20, 11-21, 21-18 win in 68 minutes. In the process Sindhu became the first Indian woman to win a title in the Korea Open. 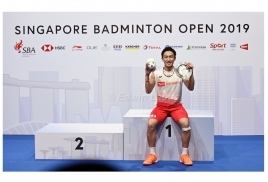 Indonesia celebrated the Korea Open with two titles - the men's singles through Anthony Ginting and the mixed doubles through Praveen Jordan-Debby Susanto. It was an all-Indonesia final between Ginting and Sea Games gold medal winner Jonatan Christie - both playing their first Super Series final. 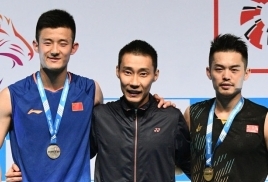 Ranked No 24 in the world Ginting - inspired by his giant killing feat in the semi-finals where he knocked out Korea's world No 1 and top seed San Won-ho - gunned down Christie (world no 22) 21-13, 19-21, 22-20 in a 68-minute match. It was a sad end to Korea - finishing empty handed in their home tournament after third seeds Chang Ye-na-Lee So-hee fell 11-21, 15-21 to China's Huang Yaqiong-Yu Xiaohan 11-21, 15-21 in the women's doubles final. Fourth seeds Praveen Jordan-Debby Susanto of Indonesia won the mixed doubles title - defeating China's Wang Yilyu-Huang Dongping 21-17, 21-18 in the final.